Want to dive deeper into the mysteries of Tarot? Try a one card draw. Even people who have studied the Tarot for years rely on this to help elucidate answers. Here, Horoscope.com contributor Cosmo Luce Christensen shares why and how to use a one card draw in your own life. You can gain meaningful insight into your own depths by pulling a single tarot card. As oppose to a multiple-card reading, a single tarot draw clears up the spirits’ message, leaving less room to twist the message to suit your most convenient narrative. Deeply connecting with the symbolism in a single card draw strengthens your intuitive relationship with the cards and your connection to the entire deck. When you take time to understand how a single card is in dialogue with the 77 others, you begin to see cycles and patterns unfold in your readings. Before you try a one card draw, take time to clear your deck. I like to spread the cards out on my floor and mix them together, like a kid playing in a sandbox. Then, shuffle with your question clear in your mind. I always know I am ready to draw when I have meditated on the question so deeply that I feel threads of intuitive energy flow down my fingers and into the deck, although the sensation might be different for different readers. When selecting a card, listen to your instinct. You might want to take a card from the top of the stack, pull the next card the following day, and so on until you make your way through the entire stack. Or you might start this process and then choose to disrupt it, pulling from the center of the deck instead. Whatever you decide is the correct choice. 1. Whether the card was upright or reversed. 2. The images in the card that stand out to you first. What do they remind you of? How do they make you feel? What do you associate with them? Let your mind wander freely. If you pull a figure card, note the position of their body. Do they looked closed off or open? Do they echo any other figures from the deck? 3. The suit that it comes from. Think about what pattern this card falls into, even if it’s the only one that appears right now. 4, Whether any other elements are included in the card. For example, if you pull a swords card, note whether there is any water that appears as well. 5. Remember: wands = fire/passion, pentacles = earth/materiality, swords = air/mind, cups = water/ spirit. If you don’t understand the meaning of the card right away, keep it out on a surface where your gaze will naturally fall upon it over the next couple of days. You can even take a picture that you return to periodically. Tarot readings always become clearer as time goes on. When you have clarity, set your intentions. What do you want to learn from this card? What do you want to change or heal? Ask yourself a series of questions that you draw from the card, and then answer them. You have all the power to set your intentions. What do you want them to be? The first thing you might notice is the bandage over the woman’s eyes, followed by the moon in the sky above her. The position of her body might echo the High Priestess, the underworld queen with intuitive sight. 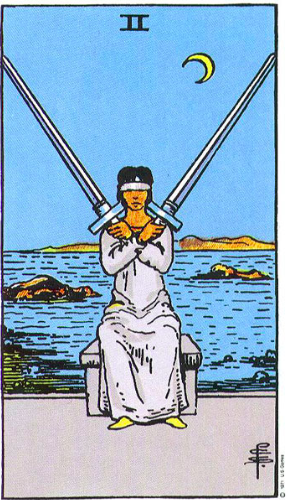 However, in the two of swords, the bandages over the figure’s eyes could suggest willful blindness, a closed third eye. The dark sea behind her may evokes pollution, and since water is spirit, perhaps you will take her to mean that polluted spiritual waters are causing her to feel resigned to her fate. The swords in her hands could evoke an intimidating pair of scissors. They could be used to cut the bandages, but she might not trust that she won’t hurt herself in the process of recovering her sight. You might find you relate to this woman strongly, or she might speak more of your lover to you. The woman in the Two of Swords has the opportunity to cut the cloth from her eyes and look at her grief, and heal from it. The longer she hesitates, the longer she is barred from joining the spiritual realms, where her figure can manifest in the High Priestess. If that happened, the moon that is positioned in the sky above her would come to rest at her feet. When I pull this card, it signifies to me that in order to get what I need romantically, I need to spend time cleaning up my polluted spiritual waters. In order to do that, I need to find a way to reclaim my connection to the spirit realm, which often speaks of grief. The two of swords in a romantic reading suggests the need to make space to grieve previous relationships and heal old wounds within this new connection. The two of swords can feel intimidating in a single card reading, and you may be tempted to pull more and more cards to avoid the obstacle it suggests. But don’t abandon your intention to only pull a single card. Doing so will clutter up the reading and won’t change the outcome. The true power of tarot becomes evident when you unpack the answers that your intuition has spoken to you, set your intentions, and refuse to be a victim to fate. A single card spread is able to show you each spoke on the wheel of fortune as it turns, and put you in better touch with the narrative you will spend your whole life to make. Want Free Tarot Readings for Life? Here You Go!